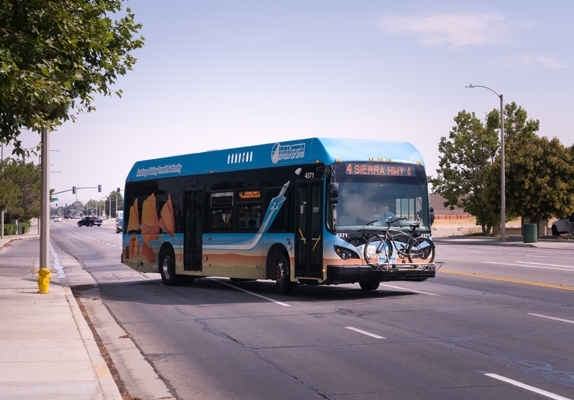 Will have an additional stop added on Avenue O-8 at Sierra Highway to accommodate a commercial facility that houses a government agency (Los Angeles Department of Child and Family Services), a daycare center, a major aerospace company and a higher educational center. Service will directly connect the Antelope Valley College's Lancaster campus with its Palmdale Center, located at 2301 East Palmdale Blvd. Each trip will take approximately 30 minutes (40 minutes trips three times per day to allow for charging electric buses). Eight round-trips per day, beginning at 6:35a.m. and ending at 6:05p.m. Monday-Friday. The 5:30p.m. eastbound trip will be adjusted to depart at 5:35p.m. to better align with Metrolink's arrival at the Palmdale Transportation Center. The morning route will return to its original course along Flower Street, after a long-term detour due to a construction project which is now complete. The route will be extended by one mile to provide service to a new stop at the West Los Angeles Veteran's Administration Medical Center located on Wilshire Blvd. Southbound trips that include stops at the VA will depart Sergeant Steve Owen Memorial Park at 5:20a.m. and 5:40a.m., and the Palmdale Transportation Center at 5:35a.m. and 6:00a.m. Return trips to the Antelope Valley will depart the VA at 3:28p.m. and 4:28p.m. In the event that health care services extend beyond the timeframe of return departures, AVTA will also guarantee that no veteran rider will be left behind at the VA facility.